My family have always been a fan of Chili's and have enjoyed the atmosphere and the food. So thanks to the kind folks at Chili's and Tésa from 2wired2tired.com, I got the opportunity to try the Triple Dipper Appetizer. Good Things come in 3's and I would love to have pizza, Spinach Ravioli, and shrimp with all the fixings on my plate. So what 3 things would you like on your plate? Boy does that look good. I had to stop the kids from eating it before I took the picture. So what did we get? (My children chose what to get) The Big Mouth bites, Boneless Buffalo Wings and the Southwestern Egg rolls. Check out the picture above. Are you hungry yet? Boy was it tasty. I had my two 16 year old kids with me and it was devoured rather quickly. The mini cheeseburgers were juicy and cooked just right. The boneless wings had just the right amount of twang and the Egg rolls were crispy and tasty. We also ordered the 2 for $20.00 deal and we got to try the cheese fries. Our entire dinner was great and we were all stuffed. Check out the menu. and see what new type of food you would love to try. You can not go wrong with Chili's. The atmosphere and the food is great. I do not get there often because it is quite a distance from my home but I am always happy when I am able to eat there. SHOUT OUT TO EAT OUT! Hey you never know you may be the next winner. 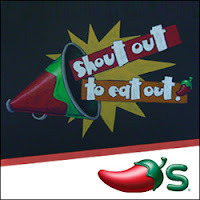 Would you like to win a $20.00 gift card to chili's so you can try the triple dipper for your self. 6. Tweet out this and leave link. At @Chilis Good Things Come In 3's! Check out @2Wired2Tired http://bit.ly/linkyrave for 200 chances to win in the #tripledipper linky rave! Giveaway ends on 6/12 at 11:59pm. Winner will be drawn by random.org and winner will have 48hrs to respond or a new winner will be picked. Good Luck. Disclaimer: I was given a Chili's gift card for my review. I filled out the Chili's form! Three foods I'd like to have on one plate...I like the Southwest egg rolls and chicken tenders at Chili's, and if I were going to put ANYTHING else on the plate, some sort of chinese food! My plate would have pizza, chocolate and garlic knots. I filled out the form. Thanks for the chance! *I know it says "extra entries all in one comment", but everyone seems to be doing each entry in separate comments lol, so I'm not sure which is right?! I love Chili's! If we go out to eat we go there! +1. I love junk food :), so the 3 fav foods I would like to see on one plate would be: buffalo chicken sliders (Chili's had these for a while and they were AWESOME! ), mozzerella sticks and mini egg rolls. +1. Like Chili's on Facebook (Colleen Turner). +1. Signed up for Chili's email club. +2. GFC follower (Colleen Turner). I love going to Chilis! I would like to have southwestern eggrolls, potatoe skins and big mouth bites! 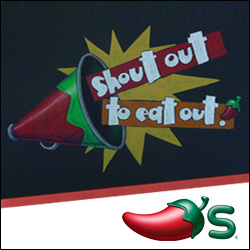 I follow @Chilis @Shoutout2eatout on Twitter. I would choose mashed potatoes and gravy, a country fried steak, and a piece of strawberry cheesecake. filled out the form with your blog name.